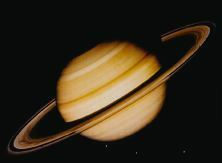 Is the second largest of all the planets. Its mass (weight) is over 95 times that of the Earth. Its diameter is over 10 times that of our planet. Is the sixth planet in order from the Sun. It is about 1.4 billion kilometers from the Sun. Makes one complete orbit around the Sun every 29.46 years. Rotates on its axis at a very fast speed. It completes one rotation in about 10 hours and 39 minutes. Is known for the many rings that go around it. Has a total of 21 satellites.